I have a CVS "extra care" card. It's one of those loyalty cards that almost everyone is doing now. CVS is very close to my house so I go there for my prescriptions. I don't know what the criteria is for getting a coupon tacked onto the end of my receipt. Sometimes I do, sometimes I don't. Usually, it's for a $1.00 off my next visit so I'll tack it to the fridge and then forget it because I don't need to go to CVS for prescriptions. Lately, with all the meds I take and with the staggered nature of the amounts I was given, I find I'm there more than I've ever been. I don't want lots of pill bottles around so I refill a script only when I'm low on it, which reminds me, the metholtrexate is due before Friday. I take the new bottle home and dump the few remaining pills from the old bottle into the new bottle, remove and shred the label and recycle the bottle. I tried giving the bottle back to the pharmacy people but they look at me funny, shrug and toss it into the trash. There is, perhaps, a reason you can't reuse it. I would imagine some pills have residue on them. But I would also imagine there's a market for recyclable pill bottles. There is a recycle mark on the bottle, after all. Having seen them just toss an old bottle, I decided I can recycle all of it and feel better about it. So, last week, I picked up another batch of folic acid. I was down to 3 pills. I got some chocolate at the same time because it was the weekend and I deserve chocolate. Out comes my receipt with the above attached. Now, these loyalty cards are supposed to provide the vendor with information on buying habits. They are supposed to guarantee that any coupons you get are tailored to what you purchase. Therfore, I won't ever get a coupon for hair dye because I've never purchased hair dye at CVS, as a for instance. This is quite interesting. I have small blue warning labels on both the Prednisone and the metholtrexate that inform me I am not to take any kind of over the counter pain reliever while on either drug. 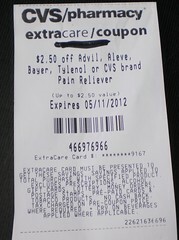 How nice, then, to get a coupon for $2.50 off any pain reliever, a drug I cannot take. In fact, I have a large bottle of plain aspirin in the medicine chest that I wonder what I should do with now. Perhaps their system needs to synch with everything in the store. I could use a coupon for vitamins or chocolate but not pain relievers. Unfortunately, I can't give this to anyone either because my name was on it. It's possible their coupon system is rudimentary. Maybe the next coupon available to me was for pain relievers and the system doesn't match up anything. Wonder what the next coupon will be? Dog food?